It looks more like an advert for an American daytime soap, than a religious experience. Any chance of finding which dentist they use? - I'd like to have some similar work done so I can save money on batteries for my cycle lights! Hallelujah! 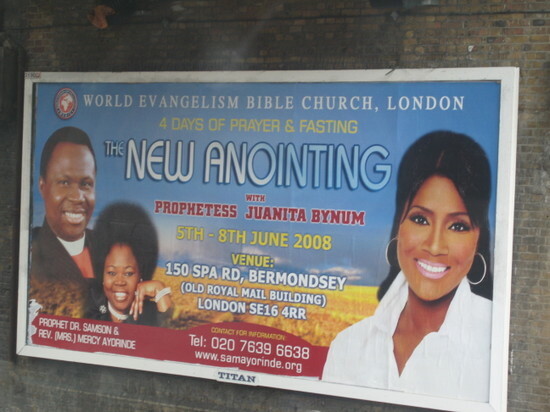 When David and I are in the car, I`ve taken to saying "Turn right at Prophetess Juanita Bynum" when wishing to take a certain route. Who needs churches, Town Hall`s, etc, as landmarks when you have Ms Bynum`s immaculate coiffure and teeth. Ms Bynum is a very wealthy woman, by the way.